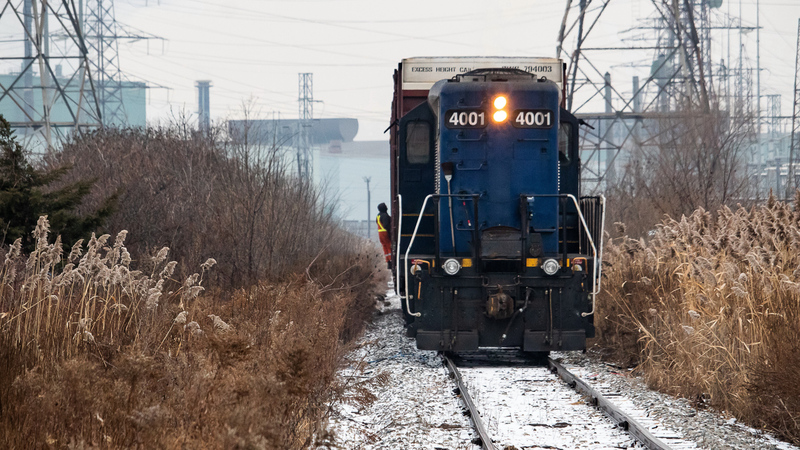 Railpictures.ca - James Knott Photo: A final shove goodbye. It was SOR’s last day, but still a day of a couple firsts for me. SOR called for a light down the hole, mid-morning I think it was. 4001 was on point, with a bulkhead and a boxcar up front, followed by a decent string of hoppers for P&H and 2500 bringing up the rear. They split the train near Bunge’s EOF (explained here) with 4001 continuing onward to Parkdale Warehousing and 2500 heading over to clear a switch and shove into P&H. Naturally, I had wanted to shoot both for some time but had yet to shoot either. And with it being SOR’s last day it was now or never for both. I did manage to get shots at both, along with Mark MacCauley whose shot at P&H can be seen here. After grabbing shots at P&H I got over to Parkdale Warehousing as quickly as I could. After all, this had always been a nighttime switch according to a crew member I spoke to that day, and I really wanted to see how they made the move with such little headroom to work with. 4001 took the bulkhead and boxcar over there, and proceeded to lift the three empties one at a time, spotting them next to the road, before spotting the two loads next to the unloading platform. This switch was performed differently than how I witnessed CN do it a few weeks later, also explained here. Given the nature of the operation at Parkdale Warehousing and how SOR performed the switch, the only somewhat decent shot I was able to get was of them shoving away, heading westward with the three empties as pictured here. In a way, the shot is a fitting metaphor for their final day of operations in Hamilton. I was sick as a dog this day, but it was going to take a lot more than a bad cold to keep me from one last chase. | Railpictures.ca – Canadian Railway Photography – photographie ferroviaire Canadienne. Caption: A final shove goodbye. It was SOR's last day, but still a day of a couple firsts for me. SOR called for a light down the hole, mid-morning I think it was. 4001 was on point, with a bulkhead and a boxcar up front, followed by a decent string of hoppers for P&H and 2500 bringing up the rear. They split the train near Bunge's EOF (explained here) with 4001 continuing onward to Parkdale Warehousing and 2500 heading over to clear a switch and shove into P&H. Naturally, I had wanted to shoot both for some time but had yet to shoot either. And with it being SOR's last day it was now or never for both. I did manage to get shots at both, along with Mark MacCauley whose shot at P&H can be seen here. After grabbing shots at P&H I got over to Parkdale Warehousing as quickly as I could. After all, this had always been a nighttime switch according to a crew member I spoke to that day, and I really wanted to see how they made the move with such little headroom to work with. 4001 took the bulkhead and boxcar over there, and proceeded to lift the three empties one at a time, spotting them next to the road, before spotting the two loads next to the unloading platform. This switch was performed differently than how I witnessed CN do it a few weeks later, also explained here. Given the nature of the operation at Parkdale Warehousing and how SOR performed the switch, the only somewhat decent shot I was able to get was of them shoving away, heading westward with the three empties as pictured here. In a way, the shot is a fitting metaphor for their final day of operations in Hamilton. I was sick as a dog this day, but it was going to take a lot more than a bad cold to keep me from one last chase.